Maybe you don’t recognize Kevin Corrigan’s name, but when you see his face and hear that Bronx accent, you realize, “Oh, yeah. That guy. I LOVE that guy.” He’s been in countless movies you like: Goodfellas, Pineapple Express, Superbad, The Departed. On TV, he’s known for Fringe, Damages, and The Mentalist. Corrigan Will Hold Court Again! Buscemi, Garofalo and Weiner at last month’s Corrigan Show. After orchestrating a historic meeting of the minds between Steve Buscemi, Janeane Garofalo, and Anthony Weiner, actor, musician and occasional Greenpoint activist Kevin Corrigan is bringing his eponymous live talk show back to Over the Eight. Lawrence Levine and Sophia Takal have gotten a lot of great attention for previous works like Green, directed by Takal, and Gabi On The Roof In July, directed by Levine. The married couple’s latest effort, Wild Canaries — directed by Levine, produced by Takal, and featuring both of them as actors — is about a Brooklyn couple who suspects foul play when a neighbor drops dead in her rent-controlled apartment. It premieres at SXSW this Saturday. Levine is originally from New Jersey but went to high school in the Bronx. We caught up with him by phone and talked about growing into wider resources, such as a cast including Alia Shawkat of Arrested Development, Jason Ritter, and Greenpoint fixture Kevin Corrigan. Former Lower East Sider Steve Buscemi has been bouncing around town lately — and we’re not even talking about Big Lebowski burlesque. Last week he dropped into Greenpoint’s Over the Eight to participate in what was apparently a “surreal” talk with actor Kevin Corrigan, comic Janeane Garofalo, and surprise guest Anthony Weiner. And tonight, he’ll be crowned King of Mardis Gras at the fifth annual Two Boots Mardi Gras Ball, which doubles as a fundraiser for the Lower Eastside Girls Club. Councilman Stephen Levin and around 20 others — including an actor you’ve seen in The Departed, Superbad, and Pineapple Express — showed up at City Hall yesterday to fight two massive towers bound for the Greenpoint waterfront. 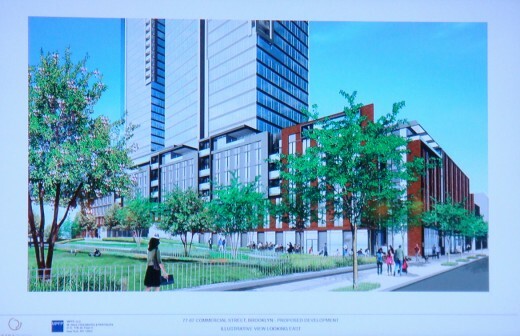 Having reached the homestretch of the city’s Uniform Land Use Review Procedure, developers of Greenpoint Landing and 77 Commercial tried to sell the City Council’s Land Use committee on their respective proposals, which would add a combined 5,000 apartment units and more than 170,000 square feet of public open space to Greenpoint’s northern shores.